A lawsuit filed yesterday in the United States District Court for the Southern District of New York alleges that imprecise language on FreshDirect’s website has been misleading customers into thinking that the service’s “Delivery Charge” — currently $5.99 a pop — is actually a tip for FreshDirect drivers. Here’s the argument: Because the home grocery delivery service already has a fuel surcharge in place and also does not explain the purpose of the delivery charge on its website, consumers may be confused. 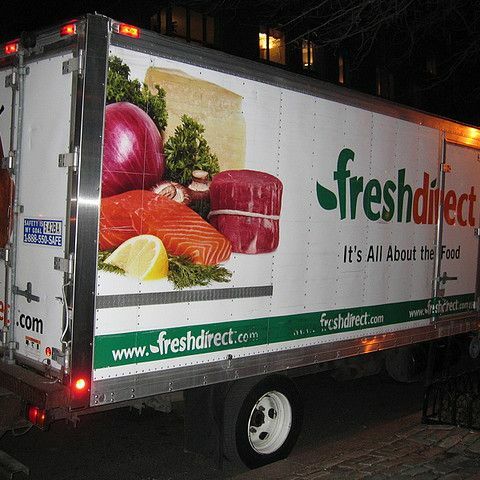 Additionally, because employees are not allowed to ask for tips and are not generally tipped, legal papers contend, FreshDirect continues to profit while its drivers are stiffed out of gratuities. Two firms, Bronson Lipsky LLP and Gottlieb & Associates, represent the class, which may grow in size to include any FreshDirect delivery drivers working for the company as of March 19, as well as all those who worked in that capacity since March of 2008. Bronson Lipsky estimates 300 delivery personnel making 50 deliveries per day translates to $23,400,000 per year in “lost” gratuities, so the larger estimate may easily stretch beyond $100 million. Lawyers allege FreshDirect acted in violation of New York Labor Law and the Federal Fair Labor Standards Act, the latter of which is being used in an effort to “recover the difference between the overtime rate at which they were paid and should have been paid,” one that includes the delivery charge.